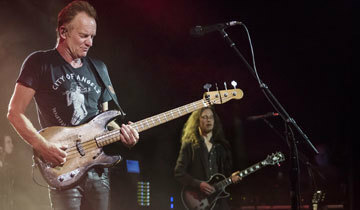 Sting wanted to surprise his audience on Thursday night, and Sting does what he likes. So the musician stepped onto the Moda Center's Theater of the Clouds stage around 8 p.m., greeting the entering audience and remembering how he once landed in London as a young musician, holding onto a single phone number. The line belonged to drummer Stewart Copeland, and it wasn't long before the two tapped Andy Summers and started the Police. But 1977 was 40 years ago, and on Thursday, Sting unapologetically turned toward his new material. A full third of the set came from new album "57th & 9th": among Police tracks and previous solo hits, the band played its first seven songs, from the straight-ahead rock of "I Can't Stop Thinking About You" to the disintegrating romance of "Down, Down, Down." "Pretty Young Soldier" was inspired by 19th century folk; car anthem "Petrol Head" sounded more like a rough night out with ZZ Top. But the rhythm section, with drummer/human Swiss army knife Josh Freese (Devo, Nine Inch Nails, Guns N' Roses, Weezer, the Replacements...) and Sting himself on bass, made even the genre detours pulse. The rock legend never met a quartet-note that wouldn't be better in eighths, and the pair's grooves were as tight as Sting's black pants. The rest of the band, including father-son guitarists Dominic and Rufus Miller, followed that lead with passion and precision. One would forgive a little grit after four decades or so, but Sting is in frankly astounding shape, vocal and otherwise: the only singing concession to age came toward the end of the set, when he steered under the "Roxanne" "Put on the red light!" high notes. The rest of us should start doing yoga, or anything, immediately. "Roxanne" in particular took the chance to stretch, pivoting into Bill Withers' "Ain't No Sunshine" and easing through a call-and-response with the audience before digging into some vintage soul chords. The set was as political as it was physical. Before climate change tune "One Fine Day," Sting addressed the world of deniers as "a (expletive) fantasy," and quoted the poet William Blake: "If the fool would persist in his folly he would become wise." "Let's hope it's not too late," he added. And there were messages in the music too obvious to ignore: "Englishman in New York" and its immigrant chorus of "I'm an alien/I'm a legal alien"; the Police's faux-capitalist "Spirits in the Material World," with its ironic call to "have no faith in constitution/there is no bloody revolution." But Sting was otherwise good-humored and energetic, propelled by a trio of beverages - he paused to take a sip of apple cider vinegar between songs - and the presence of son Joe Sumner, who opened the show with a pair of songs and took a solo turn during his father's set to perform David Bowie's "Ashes to Ashes." "Thanks, Dad," he said when Sting introduced him. The resemblance, physical and vocal, was clear, though the younger Sumner has more of a taste for the dramatic. And there were the Last Bandoleros, who joined Sumner as backing vocalists after their own set - a Latin-influenced take on tuneful pop-rock not unlike Texas predecessors Fastball. Sting, in his surprise intro, sat down to play the guitar ballad "Heading South on the Great North Road," then tried to introduce them - he called them Lost Bandoleros at first, laughing at his stumble. Then he exited the stage carrying his own chair. No one was going to stop him.